A chord progression where the dominant chord is followed by the tonic chord (V-I or V-i). The "V" represents the chord based on the fifth step of the scale and the "I" represents the chord based on the first step of the scale ("i" being the minor version of the chord based on the first step of the scale. The dominant to tonic progression (V-I) represents the strongest sound of all cadences. 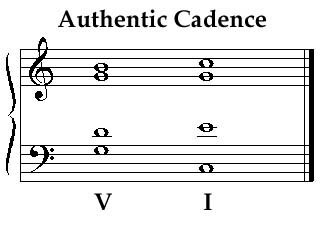 In the tonality of "C" major, an authentic cadence would be the dominant (V) G major chord (G-B-D) moving to the tonic (I) C major chord (C-E-G).